In the mid 1960's, C.E. (Red) Swift owned a large tract of land that he wanted to build homes on. Douglas County required the proposed subdivision to be serviced by a municipal water system and have paved roads to drive on. Swift tried to get the land annexed to the towns of Minden and Gardnerville but was turned down because of the proximity of the land to the Towns. 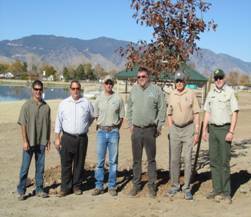 The Gardnerville Ranchos General Improvement District was then created by Douglas County Ordinance 147 on April 9, 1965. The District was created pursuant to Chapter 318 of the Nevada Revised Statutes. The first trustees of the District were D.A. Swift, W.P. Bednar, C.E. Swift, M.K. Swift and C.N. Swift. GRGID's first engineer was Engineers LTD., Inc. and its first attorney was the firm of Ernest A. Wilson and John Chrislaw. The District Board of Trustees with grants and loans started the task of financing water and street improvements within the boundaries of the District. The property within Unit two of the District was the original annexation on May 17, 1967. On the same date Unit 3, Unit 4 and Country Club Estates (golf course area) were annexed. Ranchos Estates, Unit 5 and Unit 6 were annexed into the District on April 3, 1973. Unit 7 was annexed into the District on July 18, 1974. Since that time Pleasantview Subdivision, Silver Ranch Estates, Sunburst Subdivision, Hidden Creek Subdivision, Rocky Terrace Subdivision, Rainshadow Ranch, 540 acres of land south and east of Long Valley Rd., Heritage Subdivision on Kimmerling Rd., Tillman Commercial Center, Langtree Commercial Center and many other smaller parcels have been annexed to the District. Ranchos Estates, Units 6 and 7 were developed by Sierra Charter, Inc. After Ranchos Estates was completed Sierra Charter fell on hard times and the completion of Units 6 and 7 was completed by the Southern Nevada Bartenders and Culinary Union local 226. Bonds were passed to finance the improvements within Units 6 and 7 as they were in Units 2,3,4, and Country Club Estates. The bonds were paid off by assessments against the property within the specified area of improvements. It is interesting to note that units 6 and 7 were left with paved streets, water and sewer improvements for almost five years before the first home was built. Sewer was added to Units 2, 3, 4 and Country Club Estates in the late seventies. In 1995 the State of Nevada required GRGID to compel properties that were not yet on the District's sewer system to hookup. The District set a deadline of July 1, 1998 for all persons still using septic systems to hook into the District's sewer system. The District cut back its hookup fees received a community development block grant to assist in construction costs and set up a loan program to assist residents with this process. This program was extended three times to ensure its success and has now been closed out. The District has grown by leaps and bounds since the late 60's and 70's. The District now serves over 4,400 households with water and sewer. The District serves residences outside of its District where lines were placed with the original improvements. 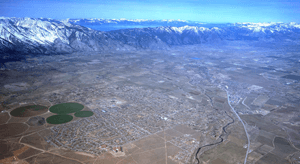 It should be noted that Unit I of the Gardnerville Ranchos General Improvement District was de-annexed during a point in the early history of the District. 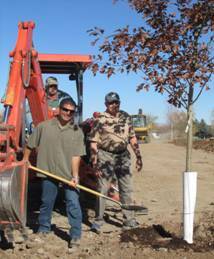 GRGID’s sewer service area goes beyond its’ boundaries to serve the Dresslerville Indian Colony as well as homes in Unit 1. The service area has been specified as the Edna Ditch on Kimmerling Rd., Waterloo Ln. on State Route 756, the vicinity of what was the Hellwinkel Dairy on Centerville Lane and the Carson River at Highway 395. The District has eight water wells and two booster stations in service at this time. The largest well produces over 1800 gallons per minute. A test well has been drilled in the Pleasantview Subdivision and shows arsenic levels above the 2006 standard of 10 parts per billion. The District will continue to seek out new well sites to keep up with the demand on the water system. 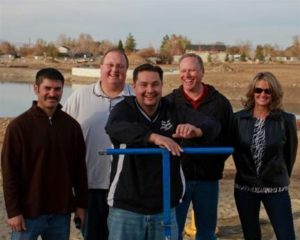 The District collects sewer effluent and sends it to Minden Gardnerville Sanitation District via a main transmission line that runs down State Route 756. Each year the District has replaced a portion of the original steel water lines put in service in the 60's with plastic pipe called C-900 iron vinyl. The District uses user fees to fund water line replacement projects. In 1998, the District Board of Trustees authorized staff to apply for a $3.2 million dollar loan through the State of Nevada Revolving Loan Fund. This loan has replaced most aging water main, fire hydrants, valves and the well house one on Fairway Dr. This project was completed in 2003. The District was approved for another $1.2 million dollar loan in 2003. These funds were used to complete the replacement project. Both of those waterline projects are now complete. The District replaced waterline, valves and hydrants on Bowles Ln. in 2010. The District uses tax dollars to maintain and clean its’ streets each year. For fiscal year 2011-2012 the District’s street maintenance budget including engineering will be over 1.2 million dollars. The District contracts for it’s' snow removal. The 2010-2011 contract for snow removal was with Curtis and Sons. The District estimates its population to be approximately 10,750 people. This estimate is based upon the number of residences the District serves. The District's population base convinced P & S Development to build GRGID's first major shopping center in 1994. Tillman Center had fallen upon hard times with the closing of Gorman’s Rancho Market. Silver Strike Lanes has replaced the Market. The Ranchos has its own U.S. Post Office. Clocktower LLC has turned the old Cottonwood Care Center into senior apartments. GRGID has a five-member board of trustees that are elected by the registered voters who live within the boundaries of the District. GRGID has a District Manager who is responsible for carrying out the policies set forth by the Board of Trustees. The Board meets the first Wednesday of each month at District Office, 931 Mitch Dr. at 6:00 p.m. The meetings are open to anyone who wishes to attend. Meeting agendas are posted at 7-11 on Tillman Ln., District Office, Under the Magic Pine Tree Day Care Center on Mitch Dr., the three schools within the District's boundaries and on the District’s Web Site www.grgid.com. GRGID is responsible for the operations and maintenance of its' water system, sewer system, streets, storm drain system, streetlights, maintenance of open spaces and parks and recreation. Because of GRGID's size and accessibility to its residents, many inquiries are fielded that are not within GRGID's control. In these cases the District will assist the resident in filing an inquiry with Douglas County. GRGID is asked to review all proposed housing and commercial projects that desire to locate within the Districts' service area. The Districts' recommendations are then forwarded to Douglas County Community Development for review and then forwarded to the Douglas County Commission. At this writing the economy has started to yawn coming out of a deep sleep. The District is seeing some new homes being built within its boundaries. Silver Strike Bowling Lanes has opened under new ownership since my last update. . The District weathered the recession fairly well due to being fiscally responsible during the good years. No projects were put off. Street maintenance work stayed on schedule. The District is working on the replacement of Well Number 4 on Putter Ln. A test well may be constructed in 2015. Mitch Park continues to see improvements. The fishing pond continues to be busy. The District has built an area for people to sit and enjoy the scenery of the Sierras or just read a book. 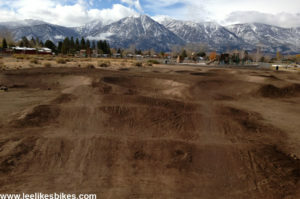 The District has a state of the bicycle pump track for beginner, intermediate and advanced riders. The District was voted by a San Francisco Company as the second best place in Nevada for young families to live in September 2013. Northern Nevada continues to feel the strain of a fourth year of drought. The District asks all of its water users to be aware of their water usage and conserve. The Cedar Creek subdivision which was once slated to be a gated community is now maintained by the District. In July 2015, the District Board of Trustees voted to add streets, street lights and drainage conveyance to the water and sewer responsibilities it already maintains. The residents of Cedar Creek pay the same taxes that all other homeowners within the District pay but did not enjoy receiving all the same services. Cedar Creek has a home owners association to handle the outside irrigation system, one storm detention basin and interior mow strips within the subdivision. Cedar Creek has started to see new homes being built within the last six month. This 63 home subdivision has smaller lots with upscale homes on them. Rocky Terrace Subdivision has started to grow once again. The 90 home upscale subdivision has seen good growth since December 2014. The average lot size is 12,000 sq. ft. Rocky Terrace has an active home owners association. Rainshadow Subdivision which is 19 lots within its first phase also have three new homes under construction. This is a good sign for the District that the economy is starting to pickup and hopefully some new stores will come to the District.